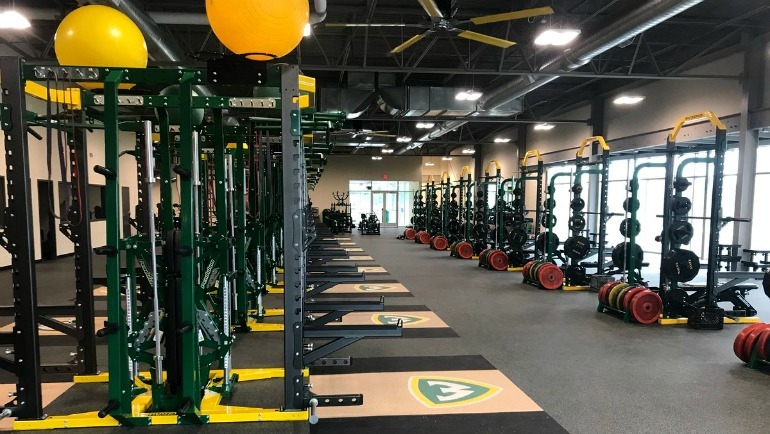 When offensive lineman and football co-captain Charlie Younger visited Wayne State a few years back as a high schooler from Eagle, Wisconsin, he noticed the university's athletic workout facilities had a bit of a homey feel. "[In high school], we used to have a smaller weight room … an old-school, dungeon feeling," Younger said. "So when I came to Wayne State and saw the close quarters and felt the heat, I thought, 'this will be good. It'll bring back memories from working out back in high school.'" For the first few years of his Wayne State career, that was just the case — working out in the dark, humid, 3,200 square-foot basement of the Matthaei Building. For the most part, it worked. Sure, there was limited space, so the 17 Wayne State athletic teams had to coordinate training schedules. And yes, the heat sometimes got unbearable in the summer months. The student-athletes and the athletic program continued to improve, but in the back of Director of Athletics Rob Fournier's mind, he knew the training facilities needed to improve, too. Enter the new Athletic Performance Center, a $2.2 million state-of-the-art facility that opened earlier this year and at 11,500 square feet nearly quadruples the space of the previous training facility. 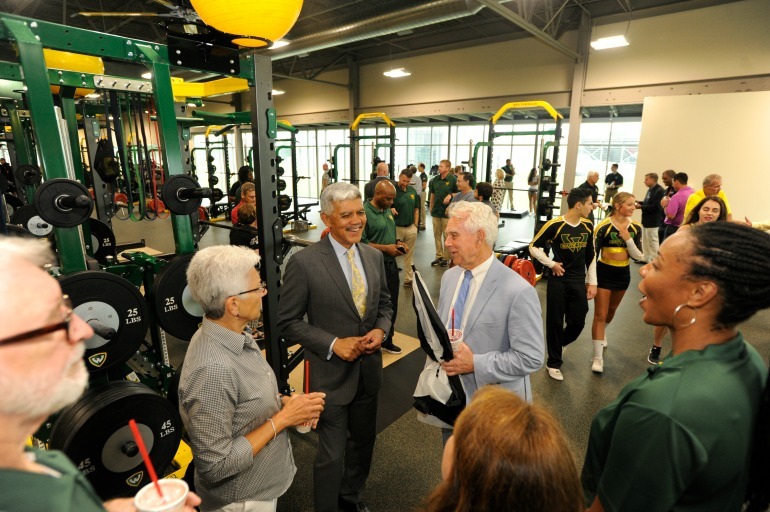 Located between the Matthaei Building and softball complex, the Athletic Performance Center features new equipment, offices, and a conference room, hydration and nutrition station. "We had to get creative in the old facility because of the size," said Ruben Mendoza, Wayne State's head strength and conditioning coach. "We could only train one team at a time, and for football, we had to split the team into three groups. The Athletic Performance Center is a game-changer for us and our student-athletes and how they train." (Left to right) Assistant Women’s Basketball Coach Karen Lafata, WSU President M. Roy Wilson, WSU Athletics Capital Campaign Committee Chair S. Gary Spicer Sr., and Assistant Women’s Basketball Coach Plenette Pierson check out the new Athletic Performance Center. The athletic department also spent an additional $150,000 on new equipment (that builds upon the equipment from the old facility). The new facility has 24 workstations — triple the number the old facility had — and can accommodate one large team, two medium-sized teams or four small teams, Mendoza said. It also has 16 inlaid platforms, which helps to absorb the shock of some exercises, up from eight in the old facility. It also has two huge industrial-sized fans helping to circulate air conditioning throughout the facility and floor-to-ceiling windows facing north and west that gives the floorplan a brighter and more open feel. "It's probably the biggest weight room in our conference," Mendoza said. "A very limited number of schools have nice facilities, but they don't compare to the size we have. We probably have a better facility than some Division 1 programs." For one comparison, Notre Dame, where Mendoza used to work, has 26 teams and a 14,000-square foot facility. Wayne State as 17 teams and an 11,500-square-foot facility. The Athletic Performance Center is the latest in a long list of brick-and-mortar upgrades during the past decade. That list includes the new Harwell Field, Doris J. and Donald L. Duchene, Sr. Indoor Facility, the basketball complex film room, softball facility and a new football field and locker room, among others. The Athletic Performance Center, however, might generate the biggest bang for the buck when it comes to recruiting, as it is the first new upgraded facility that will impact all 17 WSU teams. The most significant change between the old facility and the Athletic Performance Center is most certainly the size. "Ideally you want to do exercises that involve total body movement — ground-based training — first, then work down to multi-joint movement and single-joint movement," Mendoza said. "Downstairs, we had to rotate groups and some student-athletes had to start on multi-joint movements." "It changes the way we train," Mendoza said. "Having the room and having the weights and the equipment — we are going to get better as athletes." For some student-athletes, more room and cooler conditions has already started changing their approach — not just physically, but mentally, too. "It's a new and exciting thing and it makes you want to be in the weight room even more," said Ellie Rodriguez, a senior on Wayne State's volleyball team. "You want to get in there because of all the new equipment and machines." Younger said he likes using the new cable machines that offer varying levels of resistance as a way to bolster his workouts after completing some more strenuous exercises. "I think it will help keep us busy and allow us to get some extra work in and that will hopefully help us make a difference on the field," he said. Inside the facility, some new-age tools are helping student-athletes make the most of their workouts. One such tool is GymAware, which shows the velocity in which a student-athlete moves the bar in a particular exercise. "Visually, we will tell a kid that he or she isn't moving the bar fast enough," Mendoza said. "When you attach some of these gadgets to the bar, it actually gives you a number of how fast you're moving it, and the kids better understand what we're trying to teach. This story first appeared in Wayne State University's Department of Athletics football game program on Aug. 30, 2018.